Remember two years ago, when we were getting ready to move out of the house and onto the boat, using every waking minute to pack and plan and repair and organize? And all I could pull off for the blog was the bullet-point summary? We’re essentially back to that stage. Eventually, I’ll have the time to write thoughtfully about what the end of cruising means for us; how we’ve changed as a family; highlights and lowlights from the last two years; what we hoped to have gained from this experience. But in the words of Aragorn in The Return Of The King: Today is not that day. We left Santa Rosalia Saturday afternoon for a calm overnight passage, already exhausted after a rushed two days of cleaning. 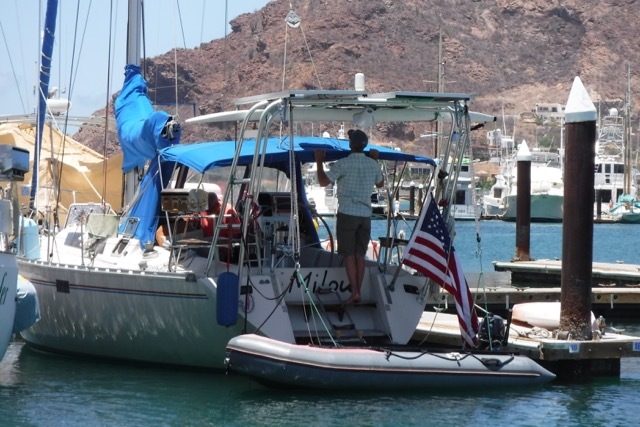 Three different potential buyers had expressed plans to visit the boat in San Carlos over the weekend of the 27th, but due to some easier and cheaper travel arrangements, one family decided to book flights for the 20th instead. That was our planned arrival date at Marina San Carlos, so we went into overdrive to get the boat somewhat presentable. We weren’t going to have the luxurious week at a dock to haul gear off the boat and do a deep cleaning, but at least this family would get to see what it really looks like to live aboard our boat, and we wouldn’t be juggling three separate buyers over the course of one weekend. 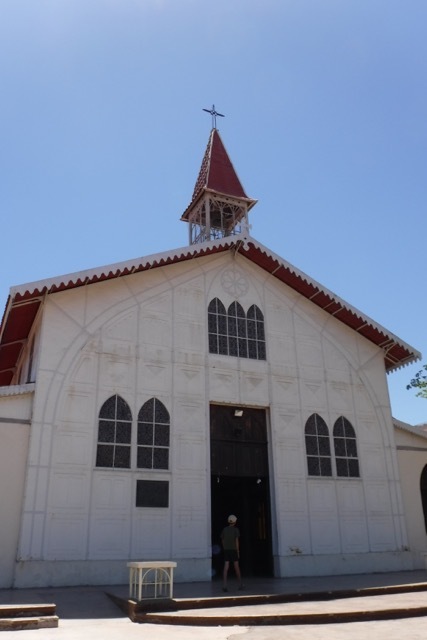 The steel church in Santa Rosalia, designed by Gustave Eiffel. 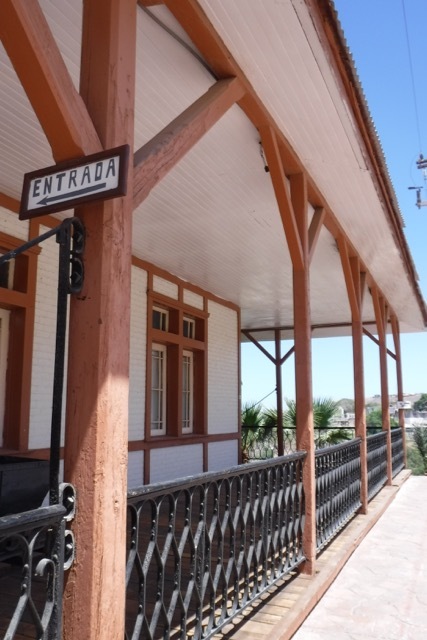 Santa Rosalia is an old French mining town, and is very different than most places we’ve been in Mexico. The passage went smoothly enough, aided by some take-out pizza and our reliable Perkins 4108, and we eventually pulled into a slip deep enough for our almost-7-foot draft. Napping was not really a part of the equation; we were too nervous about meeting our buyers. By 6, we were sharing a beer with them and spilling all we could about life aboard, sailing Mexico, and our boat in particular. Coming into San Carlos in the morning. Why does no one talk about the Evil Mosquitoes of San Carlos? Certain anchorages are renown in Mexico for their own particular bugs, but no one had warned us about the cloud of vicious biters that filled our cabin that night. The kids slept ok, but Michu and I were up all night and both look like we have some kind of pox. Monday morning saw our two families going over every part of Milou. We are bad liars, and have no interest in hiding the boat’s flaws, so we pointed out every worn spot of varnish or unrepaired fitting—while at the same time, singing the praises of our robust and newish systems, from electrical to plumbing. Our buyers were too overwhelmed to absorb even a tenth of what we were telling them, so we decided to take the boat out for a sail in the afternoon and just enjoy hanging out. The breeze was perfect; we hoisted all our sails, demonstrated the glories of a solid autohelm, and showed them how to anchor on the way back to the marina. I think they like the boat. The next day was the survey, when a marine professional would come and painstakingly rip apart our boat, evaluating every little piece for flaws or wear. At least, that’s what’s supposed to happen. The surveyor our new folks hired never actually hoisted the sails, missing the small tear in the foot of the genoa; he didn’t understand anything about lithium batteries; he didn’t point out the stains from water ingress near our fixed port lights from when they used to leak. 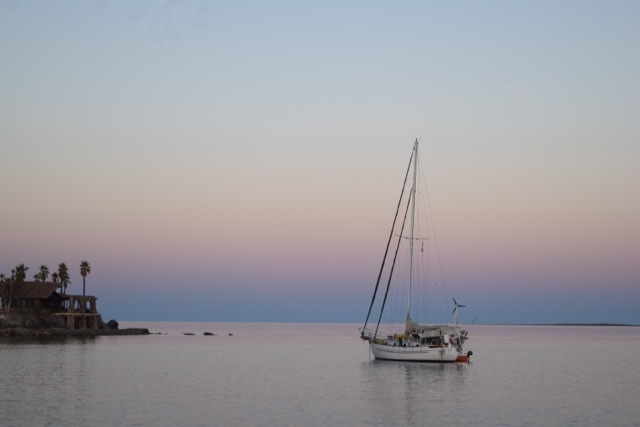 There was a lot he missed about the boat’s condition; yet he still chose to compare our boat to some very neglected and ill-equipped Beneteau First 38s that had sold in the past few years and pretend that they were essentially the same as our boat. We were really unimpressed with his abilities and his subsequent recommendations to the buyers. Poking around during the survey. Nevertheless, we persevered, and by 7:30 that night had reached an agreement on price. Milou is officially sold! Is Milou officially sold? Well, almost. We aren’t using a broker, so we’re working out our own contract, which is almost done. It takes a while for the title to transfer. The surveyor still needs to inspect the boat out of the water, which won’t happen until we haul on the 31st—although, having had her out of the water so recently, we feel pretty confident about her condition. The final settlement won’t take place until August. 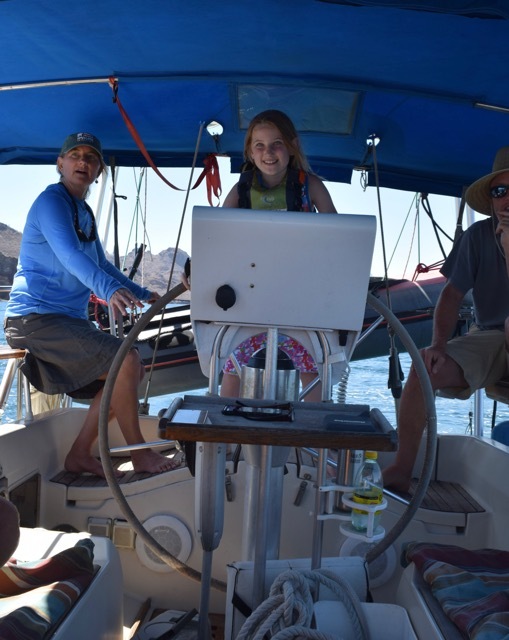 But I think we have very happy buyers, eager to take our boat around the Sea of Cortez next season with their nine-year-old daughter, and we’re feeling pretty good all around with the arrangement. No rest for the weary, however. 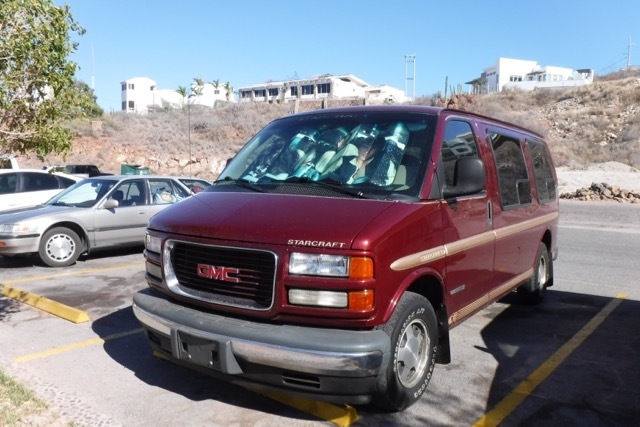 After another sleepless night, our family split up; Michu took a ride north with our buyers to search out a van in Tucson, and the kids and I stayed behind on the boat to assess what needed to happen before hauling out. It was the first time our family has been apart for more than a few hours in the last two years, and it felt really weird. Soon to be the norm, I guess, once we return to school, jobs, and schedules. 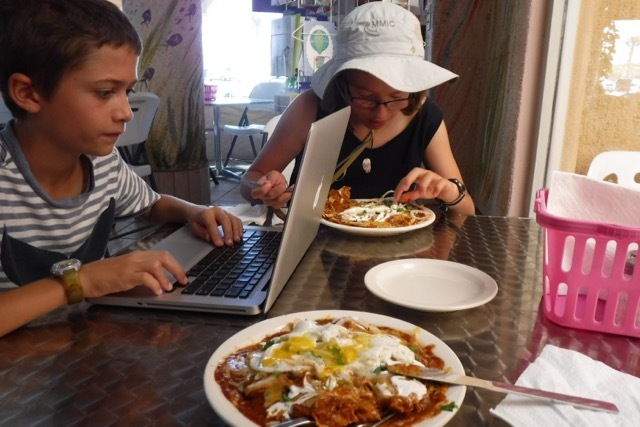 Kids and I enjoying internet and chilaquiles. Michu quickly found a vehicle that we hope will hold our stuff, at least until we can cross the border and ship some things back to the Midwest. 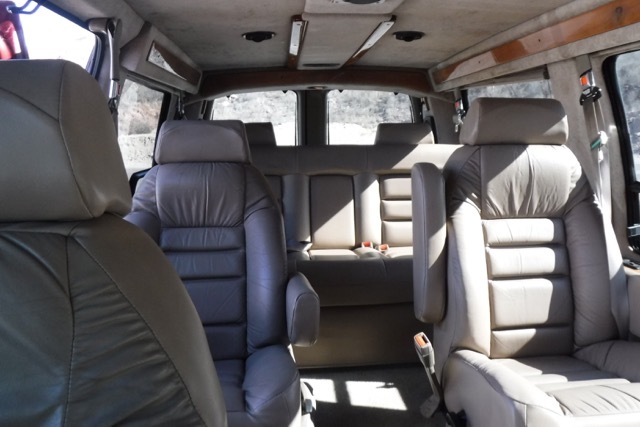 Our new ride is a GMC Savana full-sized van, and it is AWESOME. It goes so fast! The seats are so cushy! There’s this stuff called air conditioning that controls the heat! Phenomenal. Title, registration, insurance, and the quick purchase of a phone with an actual contract, and Michu was back by Friday with most of the accoutrements of American land life, including a Starbucks coffee cup next to the dash. Look at all the space that we can fill up with smelly boat stuff! So now we are scrambling. Decommission the boat, so she is well-stowed for the summer. Remove all our personal gear. Process a great deal of weird paperwork. Plan a two-month road trip. It is insanity. But really, it’s pretty strange to think about our end game. I don’t want to jinx anything, but…when we were planning our two-year trip, we said we’d sail out of Milwaukee; down the East Coast of the US; through the Bahamas and a bit of the Caribbean; through the Panama Canal; up the western coast of Central America and Mexico; and sell the boat in the Sea of Cortez. That’s exactly what we did. It’s hard to believe, but here we are, finishing up a trip of a lifetime, just as we’d planned when we started out. Finally–thank goodness for buddy boats! 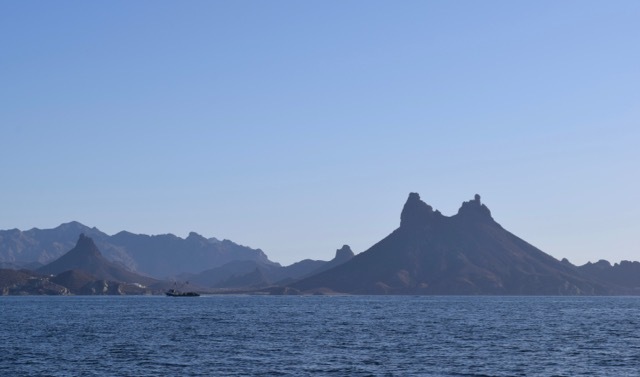 This is Nomi at anchor south of Santa Rosalia. We’ve been leaning heavily on each other for the past week to juggle kids and pull off boat tasks, as we both deal with exit plans. ← Yet another photo dump. Bravo! Greatly looking forward to your homecoming. 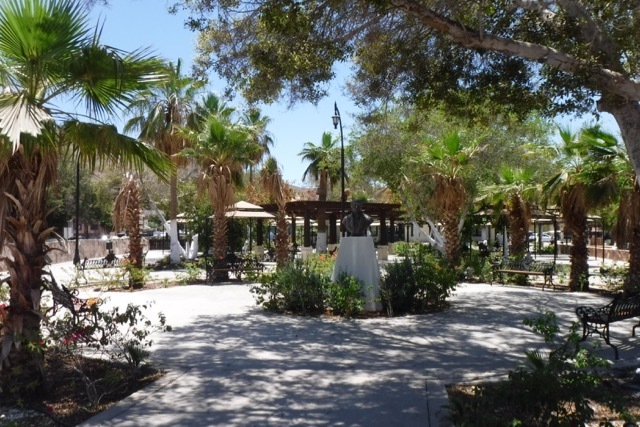 We have enjoyed your exciting adventure via the blog. The pictures were remarkable too. Thanks for inviting us along. NO I DON’T WANT MY BOOK TO END! although I must say that is the easiest I have ever heard of a sailboat selling! We’ll keep writing until the end of August or so. Still have to figure out how to navigate land life. Congratulations. You should be very prioud of what you accomplished. Very exciting times for you. Be careful going home. Welcome home. I have enjoyed reading your blog over the last year. Such grand and anticipational news!!! Soooo Looking forward to seeing you guys. Do send news of travel itinerary and dates. Ha sido un verdadero placer hacer el viaje con ustedes por estos dos anos . Esta experiencia para usdetes y sus dos hijos vale mas que cuatro anos de universidad. Estoy muy orgulloso de tener familia como ustedes, aventureros, abiertos y a darle la bienvenida a todo tipo de cultura y situacion. A mi me hubiera encantado tener padres como ustedes y haber aprendido lo que tus hijos han aprendido en este viaje internacional tan magnifico. Un fuerte ABRAZO con mucho carino Hector Y Bob . Feliz a decir que puede leer todo su mensaje, despues de un ano en los paises donde hablan espanol! Si bueno a conocer ustedes a Miami. Gracias por todo! Congratulations on an amazing two-year trip and many, many thanks for sharing it with all of us. I too will be sad to see these posts come to an end but look forward to seeing you all in person later this summer! Congratulation!! We think of you Guys all the time. It might be a bitter sweet moment, but what an adventure! Hope we can get together at some point. What a journey! I remember questioning you two on whether or not you would be safe in all these different countries and locations. I’m so glad that you were right….you were “just fine”! I so enjoyed your blogs and superb photos, Deb. Sweet ride!! We’ll be looking for something similar soon. I’ve read every post, proudly, and look forward to a grand finale. And La Flota with your family in September! It’s hard to believe a whole two years has passed since the Bon Voyage in MKE. I just got the pun- “afoot!” HA!